Wall Street has had it with the obsession over Donald Trump and everything going on in Washington. Yes, what happens in the nation's capital will affect the broader economy -- to a certain extent. But the outlook for Corporate America will have a bigger impact on the market. Voya Investment Management market strategists Douglas Coté and Karyn Cavanaugh wrote in a report Thursday that people are "generally paying just a little too much attention to the noise from Washington." Even if Trump and the Republicans in Congress are not able to get a bill through that repeals and replaces President Obama's Affordable Care Act, that's not the end of the world. "Investors need to focus on the strong economic trends that affect company earnings instead. The ACA vote is not the make or break moment for the new administration," Coté and Cavanaugh wrote. 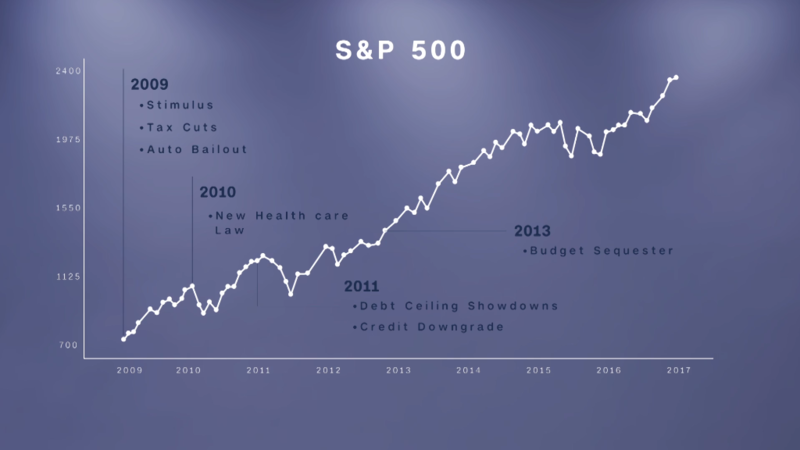 Presidents often get too much credit -- or blame -- for how the market and economy are doing. This is not to say that a president (and Congress) have no impact. But the long-term movement of stock prices tend to be governed more by interest rates and earnings. "This rally is now more about the economy stabilizing," said Fred Goodwin, macro strategist with State Street Corporation. And that's a continuation of what was already happening when many on Wall Street thought Hillary Clinton, and not Trump, would be president. It's simply not logical to say the economy and markets are better now because of Trump when they were already doing well in the last stages of Obama's second term -- and when expectations were for Trump to lose. Goodwin notes that Wall Street has breathed a collective sigh of relief about Trump once it became clear how pro-business his agenda would be. But Goodwin thinks comparisons to Reaganomics are "ridiculous." He also said that it's important to remember that this rally is now getting a little long in the tooth. The bull market turned eight years old earlier this month. So it may be unreasonable to expect stocks can keep climbing further -- and that would have been the case if Clinton had won too. Then again, there's a saying on Wall Street that bull markets don't die of old age. As long as earnings remain solid and the Federal Reserve doesn't go overboard with rate hikes -- which could slow the economy -- then stocks could keep rallying. The pace of the rally may slow but the direction could still be up. "There is no indication of economic weakness around the corner," said Tom Anderson, chief investment officer at Boston Private. It's also important that the market no longer is about just what happens in America. Anderson noted that the most recent market slumps in mid-2015 and early 2016 were triggered by fears about a slowdown in China. Those fears have largely passed -- and had little (if anything) to do with then President Obama, Congress, or even the Fed. Still, Anderson gets why the markets (and media) are still fixated on the nation's capital. The news never seems to stop. And it's increasingly wacky. It's sort of like rubbernecking on a highway when there's a car crash. "People are paying too much attention to Washington, but it's hard not to since there is so much going on and the dynamics are so atypical. It's hard to look away," Anderson said.